Joe Hisaishi is a master of the leitmotif and of clever orchestration. Think of a Japanese John Williams. 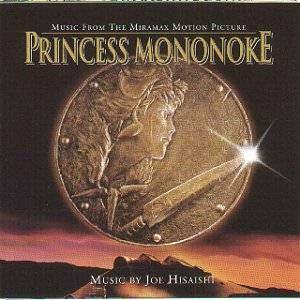 The soundtrack from "Princess Mononoke" (a film released in 1997, only now reaching the world at large) may take some work getting into, but grasping onto its pulse the score hauls you along a ride of various beauties and terrors. The first things you notice are pleasant enough, but listen closely and you discover so much going on beneath the surface, so much complexity and heart. The scoring is preponderantly symphonic, and the synthesizer padding is extremely well used so that it is a continuation, as opposed to an impoundment, of the composer's ideas. The opening track, 'The Legend of Ashitaka,' introduces the central melody -- actually one in a series of those delightfully lush, extravagant ordeals, these with an obvious and attractive ethnic flavor. But the score wastes no time in getting to the action, as 'The Demon God' pounds out a creepy, brutal recurring motif befitting of any nightmare. 'Kodamas' brings pizzicato strings,wood blocks, and otherworldly sounds together in a peculiar fashion that left me curious to hear more. Another thought: the fanfare and cadence of 'The Furies' is worthy of a master composer from Hollywood cinema, just as the undulating sorrow of 'Requiem I, II, & III', softly offer dissimilar subtlety some moments later. The 'Theme Song,' also sung to ripe lyrics with delicate polish by Sasha Lazard near the disc's end, is sumptuous. 'The Battle Drums' plays in the grand tradition of The Drummer's Salute; rhythm is king. 'World of the Dead I & II' are a particularly distinguished pair, being the most unusual tracks on the disc as a wall of electronic and electronically amplified effects fly about the orchestral sound; *this* is how one may use a synthesizer to brilliant effect. By enormous contrast, 'Ashitaka and San' is possibly the most refreshingly typical; the piano love theme set against a halcyon instrumental background is impressively classical in form and development. Unforgettable. The soundtrack has refulgence galore! This is a film score that has a functionality of its own, the sort of dramatic impact to not only support a film but rewrite it so that on top of the film you have the excitement of another unique vision. This is what helps make film music special.